I don't usually post street art. It's not that I don't love it or pay close attention to it, I simply want the focus of this site to be the challenging of advertising's control of the public environment. Outdoor advertising criminalizes street art and other such activities by privatizing and commercializing the public environment. This happens to be a perfect example of proper public use of public space being subjected to the overbearing visual control expedited by the commercialization and privatization of the public environment. First 11 Spring Street got buffed and turned into "painfully-gorgeous" condos, and now one of the only remaining (if not the only remaining) big street art spot left in Manhattan is following suit. Well, sort of. 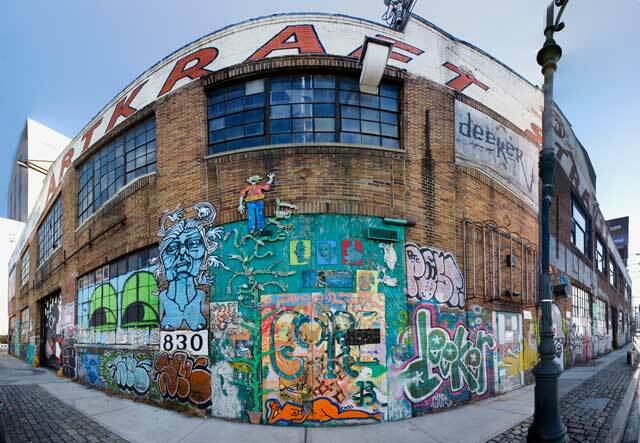 The NY Post's report on the former Artkraft Strauss headquarters located at 57th Street and the West Side Highway may have put the building on the fast track to getting buffed. Currently owned by the Durst family and occupied by Anita Durst's Chashama, one artist who rents a studio inside tells us: "we wanted to cover the entire building with art but because of an article in today's Post, the building owners are going to buff it unless we can convince them otherwise." The paper called the building "a symbol of neglect and a magnet for petty crime," and reported that "the planned artwork on the side of the building has sprouted and begun to attract unwanted graffiti and ugly 'tags.' A number of windows also have been broken." Patting themselves on the back, they declare "when we pointed this out yesterday, action was taken." Indeed, the building owner told them, "In several weeks we will refurbish it."